It becomes all too obvious to us that this sailing thing we are trying to do is not a task taken lightly. We have to actually depend on the wind! Monkey is our navigator and has a little nip once in a while. Late spring winds can be really light, strong and strangely fluky in the Sea of Cortez and Traveler is a big fat barge that needs ten knots of wind just to give her positive steerage. 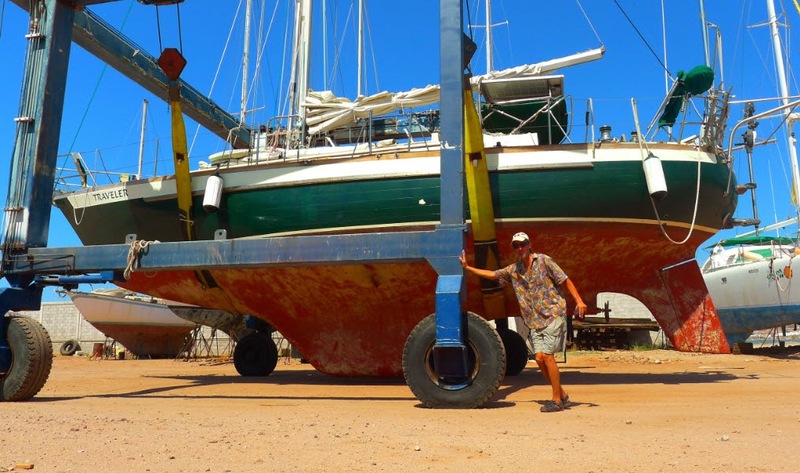 Four hours of Sunday sailing brought us only eight miles from San Juanico to Punta Pulpito. 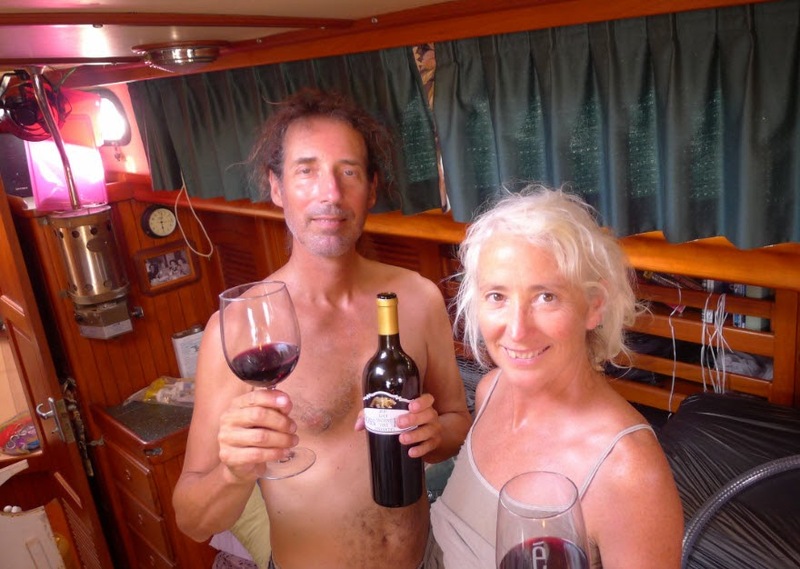 Seven hours sailing on Monday merely found us off of Punta Medano Blanco where we knew we’d not make it the 21 miles further around the corner into Concepcion Bay. We’d already fought ourselves 14 miles upwind and the day was getting long. Shawn and Heather’s guide book had no mention of anchorages along this lonely coast, but when we rounded the little headland Connie spied a sailboat anchored near shore. We got out the binoculars and checked it out. Sure enough, there was a good sized yacht swinging at anchor. We like Shawn and Heather’s book because of the beautiful color charts and multiple waypoints. Accurate waypoints are a life saver in Mexico as the paper and electronic charts can be more than a mile off. We use the paper and electronic charts to get the general lay of the land then when we get within a couple of miles we look to the guide books for the exact latitude and longitude and I program those waypoints into the little Garmin chart plotter. Shawn and Heather do a fantastic job on most of the major anchorages. However, Captain Rains’ book has more not-so-popular anchorages mentioned and we find this helpful when we are running out of options. Jack Williams’ old book is fun to read as he sprinkles in some history as he describes what this coast looked like back in the 80s. Charlie’s Charts is valuable also with detailed drawings of bays, anchorages, passages, and prominent points of land. Most mornings we wake just before sunrise, as the light begins to fill the cabin. 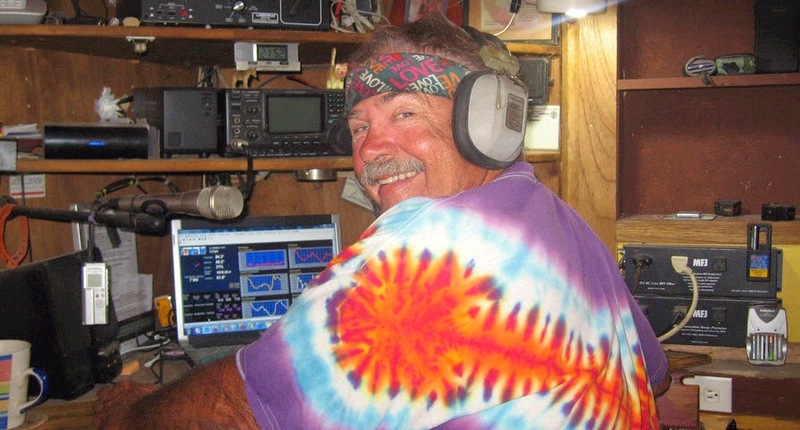 One of us will get up in time to switch on the HAM radio at 07:45 and tune it to the Sonrisa Net at frequency 3968 when Gerry gives his famous weather report for the Sea of Cortez, Mexican Riveria, and outside Baja. We’ve been listening to Geary for two seasons now and have come to rely on him as does everyone cruising in these waters. Boaters with a HAM license can check into the Sonrisa net and get detailed weather routing information from Geary. 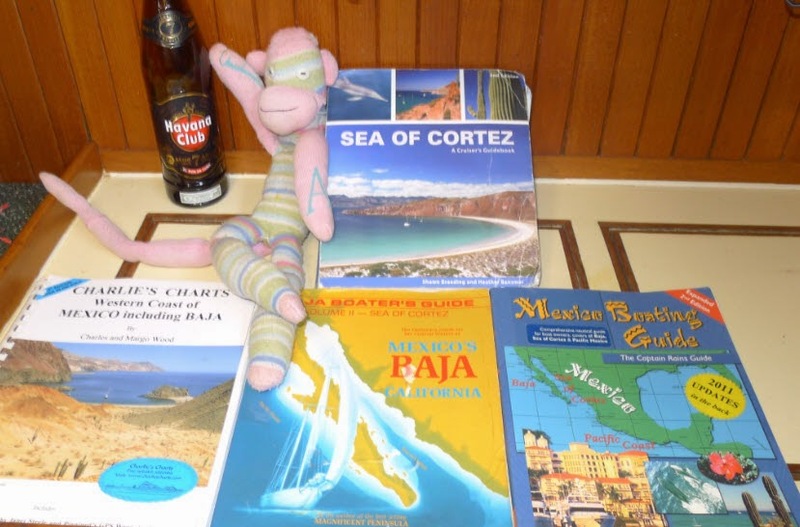 He’s located in Concepcion Bay just south of Mulege and has a little house on the beach at Burro Bay. We decided that we MUST do the pilgrimage to Burro Bay and pay homage to this famous prognosticator. It was a long haul around the outside of Concepcion but the genaker headsail made it very pleasant. The wind built as we rounded the cape and I learned AGAIN that we should douse that big sail when we see the first signs of white caps. I fought the sock down around the sail, hanging on with all my weight, and then rolled out the genoa as we beam reached into the big bay. At first we thought we’d take advantage of the good wind to reach on down the bay to Burro but two miles down I spied the flat water up ahead and just knew we’d be hating life trying to make the seven more miles to the anchorage. So, over Connie’s objections, we tacked around and ran back to the anchorage at Santo Domingo. Ahhh! Anchor down at last. 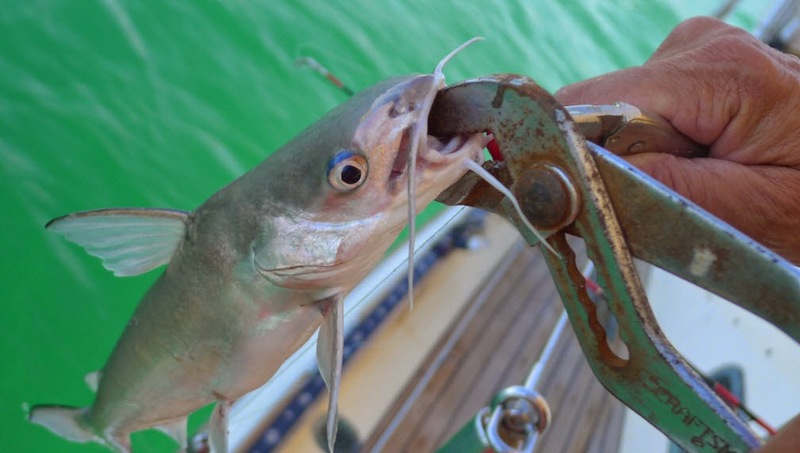 These little sea catfish swarmed the shady side of the boat. Very easy to catch, and tasty! The following day, with a dinghy assist, we made it to Burro Bay and spent a couple of days there in the sweltering heat. Connie and I found Geary in the local bar there in Burro Bay. We brought an offering of a bottle of Trader Joe’s wine and told him our story of engine woe. He drank his coke, smoked his cigarettes, and nodded sagely then took his wise self off on an errand swinging the wine bottle beside him. Connie and I finished our beers then hustled back to the boat, our homage paid, our duty done. Check that one off the list! Lunch in Mulege - Eating out is a treat after a week at sea. By this time the daily temperatures were reaching 97 degrees. It was over 90 degrees in the cabin so Connie slept out on deck while I tossed in the sauna of our stateroom. I can sleep if it is less than 85 degrees but anything over that and I’m not happy. Connie is a human heater and needs fresh air for sleeping so she roams the hot boat at night looking for a cool spot. 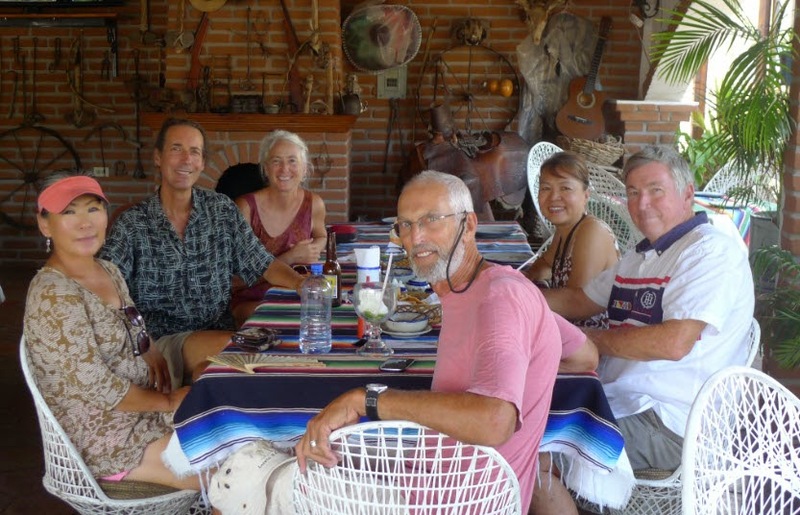 We met some folks in the bay, Suhwa and Jerry on Calypso and Joy and Captain Ron on Intima-Sea and we all hired a taxi to take us into Mulege for shopping and lunch. It was a nice day, in a good small Mexican town. I can see why people come down there from the states. Traveler under tow. Flat seas are normal in Bahia Concepcion. The next morning Intima-Sea took us in tow through the glassy water and dragged us back out to Santo Domingo where the wind built beyond belief as we tried to tack into the bay. Ahh. Cool, fresh wind. We jumped on Sunday, that is, we started across the Sea of Cortez bound for Guaymas. After catching the slight southerly out of the mouth of the bay we were becalmed for a couple of hours. I took the opportunity to finish sanding the guck off the short section of deck that we’d stripped of teak the week before. I looked up to see a sailboat heading across Traveler’s stern and jumped to reel in the fishing line we had streaming out behind. When the boat was about 100 feet away it lurched to port as the pilot realized that he was seconds away from ramming us. The good thing is that he brought a good east wind with him that we rode the rest of the day and into the night. After sundown Connie took her shift at the wheel and as I tried to sleep the winds built and built. By midnight we were in 20 knots of wind that bowled us along at 7.2 knots. Did we have the main reefed? No. Did we have the Genoa rolled in? No. Will we ever learn? It appears not. As the wind stayed constant the waves built as Connie tried to sleep and I rode the rocking cockpit into the night. We went so fast that our arrival in Guaymas would be in the dark… if we maintained our speed…so I tacked around and retraced our track for 45 minutes before tacking around once again back on our original course as Connie came back on at 03:00. An hour later I woke to slatting sails and found us in a topsy turvy sea and a windex that rotated around without any clear directional purpose. No wind. 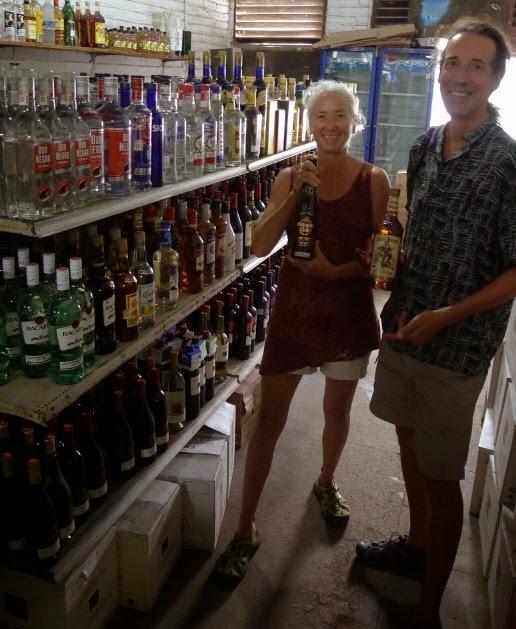 Finding Havana Club in the little store. Connie finally got us moving and fought us nearer to Guaymas in the morning dawn. We were both pretty sleep-deprived by that time and I opted to close Bocochibampo Bay as a good shelter to the building morning southerly. And again, from dead calm, to light winds from the north, then south, then east we found ourselves bowling along at seven knots reaching into our anchorage. Becalmed for 15 minutes, we crept around the corner and sailed gloriously into Bocochibampo Bay for a perfect anchoring maneuver and a celebration of breakfast Bloody Marys for all! We collapsed into deep sleep only to waken when some boaters got our attention as they drifted by with engine problems. We gave them water for their radiator and some tools then sat on deck in a dazed condition after surviving an all-nighter close reaching our way across the Sea of Cortez. By bed time that evening the winds had shifted to the north coming off the hot desert. Temperatures climbed and by midnight our thermometer recorded 100 degree air streaming into the boat. The coolest place Connie found was sleeping on the floor. I shut the windows in the master cabin and opened up the floorboards bringing in the “cool” 88 degree hull temperature; another bad night’s sleep. Celebrating the crossing with a special bottle of wine. 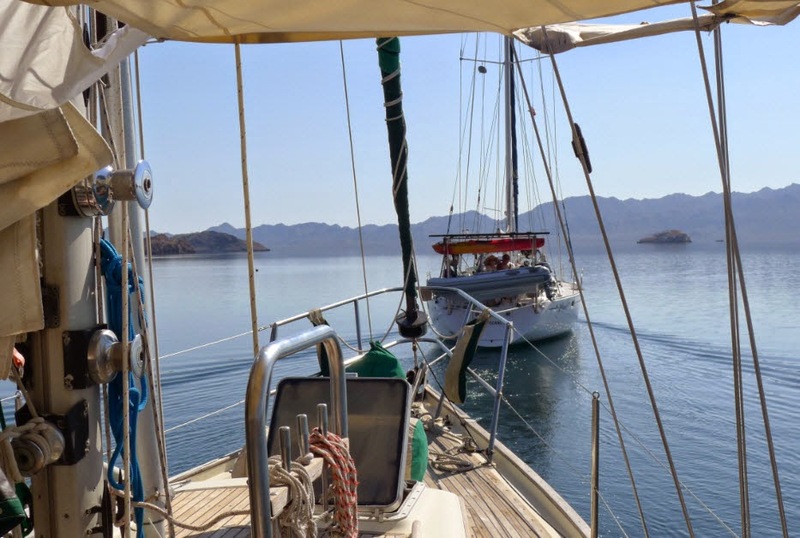 In the morning we tacked out of the bay and fought a 2 knot current around the corner, arriving in the Guaymas bay late in the afternoon. We then tacked our way into the harbor, heeled over at 7kts. in 14 feet of water, up and around to anchor in 8 ft of water just off the Guaymas Seca where we had an appointment to haul the boat in the morning. Another hot night and we got Traveler moving across the water with the aid of the dinghy and assistance from our new friends on Island Wind; thanks Heather and Ken! We negotiated the shoals and made it to the travel lift ways. Then we met the crew at Guaymas Seca. 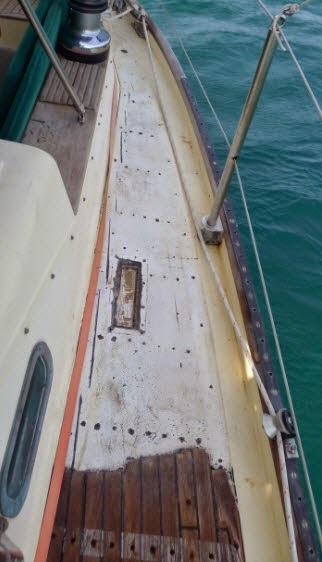 The size of the lift made it necessary for us to either dismantle the radar post on the back of the boat or take off the roller furler and headstay from the front of the boat. We opted to pull off the headstay. To take the tension off the headstay Connie loosened the backstay by turning the turnbuckle. Then I took a piece of line and tied a loop through the bow roller and the shackle above the furler head. Then I took a screwdriver and inserted it in the loop and turned it round and round, twisting the loop of line, kinda like you do when you tension a fence. This drew the forestay closer to the deck, bending the mast forward so I could slip the pin out and free the furler. Clever huh? With the forestay and staysail stay off, the lift could get centered on Traveler properly. See how the front of the lift is aft of the forestay? Soon Traveler was airborne and rumbling across the dirt yard. There is nothing so strange as seeing your marine home way up in the air rolling across a yard at 1 mile per hour. The hull is so enormous! Now we are up in the air, on the hard, with our first actual showers in three weeks. I’m clean, sunburned, dazed, fat and happy. 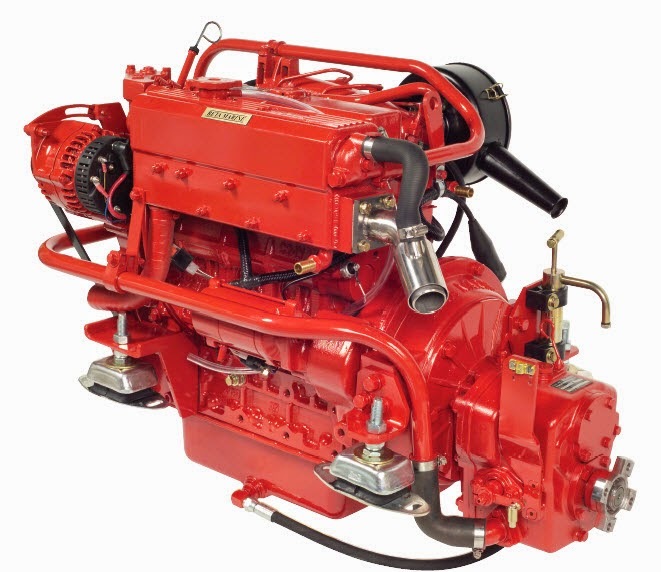 It will take a few days to get my energy (and mojo) back so we’ll try to take it easy as we prep the boat, arrange for a new engine, and get ready to bus south to Mazatlan to pick up the little Dolphin RV. Scott's birthday present to himself. In the tropics, the inside temperature difference between a white boat hull and a dark boat hull is about 20 degrees F, where white boat hull is at least 20 degrees cooler inside. Similarly where in the hot tropical sun, it is almost impossible to walk on teak decks or grey decks with the bare feet, walking on white decks with bare feet is no problem. White decks are that much cooler to walk on.